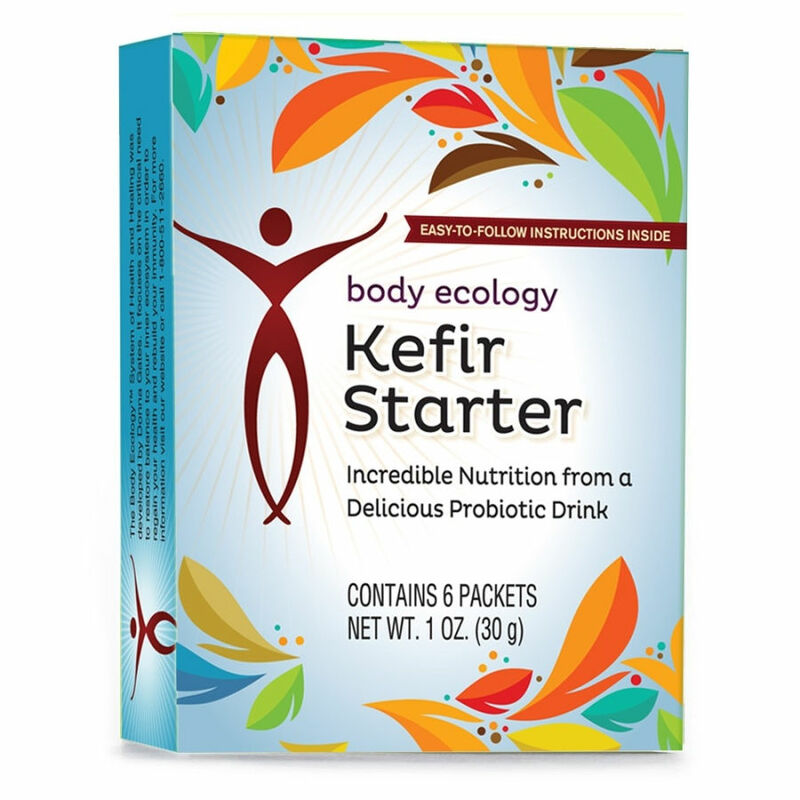 If you are serious about boosting your immunity and increasing your daily energy, then adding traditionally fermented foods to your diet is a must and Body Ecology's Kefir Starter is essential to your health regimen. Kefir, which means "feel good" in Turkish, is an ancient cultured, enzyme-rich food filled with friendly micro-organisms that help balance your "inner ecosystem" to maintain optimal health and strengthen immunity. Kefir's tart and refreshing flavor is similar to a drinking-style yogurt, and it contains beneficial yeast as well as the friendly "probiotic" bacteria found in yogurt. When used regularly, the naturally occurring bacteria and yeast in Kefir combine symbiotically to help balance your intestinal flora and boost your immunity. The exceptional nutritional content of Kefir offers a wealth of healthy benefits to people in every type of condition. More than just beneficial bacteria, Kefir contains minerals and essential amino acids that help your body with its natural healing powers and maintenance functions. Tryptophan, one of the essential amino acids abundant in Kefir, is well-known for its relaxing effect on the nervous system. Because it also offers loads of calcium and magnesium -- both of which are critical for a healthy nervous system -- Kefir in the diet can have a particularly calming effect on the nerves. Rich in vitamin B12, B1, and vitamin K, Kefir is an excellent source of biotin, a B vitamin which aids the body's absorption of other B vitamins, such as folic acid, pantothenic acid, and B12. The many advantages of maintaining adequate B vitamin intake range from regulation of the normal function of the kidneys, liver and nervous system to helping promote healthy looking skin, boosting energy and promoting longevity. Kefir's ample supply of phosphorus -- the second most abundant mineral in our bodies -- helps utilize carbohydrates, fats, and proteins for cell growth, maintenance and energy. While both Kefir and yogurt are cultured milk products, they contain different types of beneficial bacteria. Yogurt contains transient beneficial bacteria that keep your digestive system clean and provide food for the friendly bacteria that already are present. 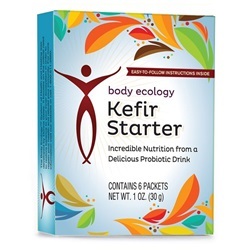 Kefir actually helps to colonize your intestinal tract -- a feat that yogurt cannot match. Additionally, Kefir contains several major strains of friendly bacteria not commonly found in yogurt: Lactobacillus Caucasus, Leuconostoc, Acetobacter species, and Streptococcus species. It also contains beneficial yeasts, such as Saccharomyces Kefir and Torula Kefir, which help balance the intestinal flora, including promotion of beneficial yeast in the body by penetrating the mucosal lining. They form a virtual SWAT team that housecleans and helps strengthen the intestines. Kefir's active yeast and bacteria may provide more nutritive value than yogurt by helping digest the foods that you eat and by keeping the colon environment clean and healthy. The curd size of Kefir is smaller than yogurt, so it's also easier to digest, making it an ideal food for babies*, the elderly, and anyone with digestive health concerns. How Kefir is made - The granules contain the bacteria/yeast mixture clumped together with casein (milk proteins) and complex sugars that ferment the milk, incorporating their friendly organisms to create the cultured product. The granules are then removed with a strainer before consumption of the Kefir and added to a new batch of milk. Here is a great video of Truth Calkins at The Longevity Now Conference demonstrating the different things you can do with your Kefir starter packs! Lactococcus lactis, Lactobacillus Kefyr, Candiad Kefyr, and Sacharomyces unisporus. Once thickened, shake or stir vigorously and place into the refrigerator. Even in your refrigerator the fermentation process continues, but chilling will slow down the fermentation of the healthy bacteria and beneficial yeast. * Directions for transferring kefir after the initial batch has been made and directions for making kefir cheese are included on packaging.